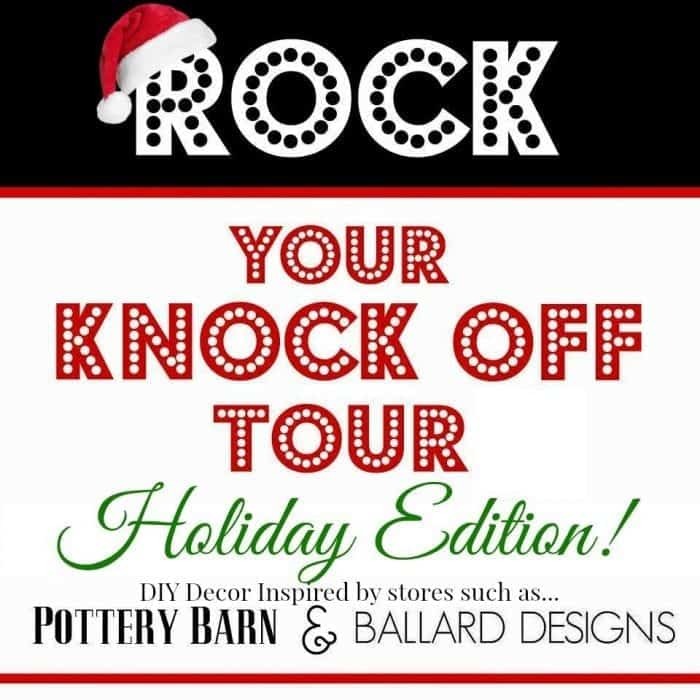 #RockYourKnockOff Tour is a group of talented bloggers who are inspired by stores like Pottery Barn and/or Ballard Designs and show you how to create one of their products. At the end of my post you can visit these amazing blogger knockoff. My knock off today is from Pottery Barn Painted Snowman pillow and the cost is $39.50, my cost, free. I love snowman and since that is the theme for our Christmas it was only fitting that I make this pillow. I had all the supplies on hand; let's face if you are a crafter like me, you have endless supplies of products in your home to make tons of projects. The products I used were a pillow, paint, paint brushes, freezer paper, sharpie and iron. I drew on freezer paper with the shiny side up and created my snowman using sharpies. Once I was done I ironed the freezer paper design, shiny side down to the pillow case. Make sure to iron the design well. Once I was done with the iron, I peeled away the freezer paper and I was left with this outline. The outline was helpful and I was able to use paint and paint inside the lines. I really love how it turned out. PB pillow on the left and DIY180 pillow to the right. What do you think? Pretty close right? I loved how it turned out and the best part is it didn't cost me a thing. I love doing knockoffs and I have a few more I am going to be sharing with you. Thanks for stopping by and make sure to visit my friends from the tour. I didn't know you could do this with sharpies and freezer paper! Great project. Pinned! Wow! You are a great artist! Your pillow looks fantastic! 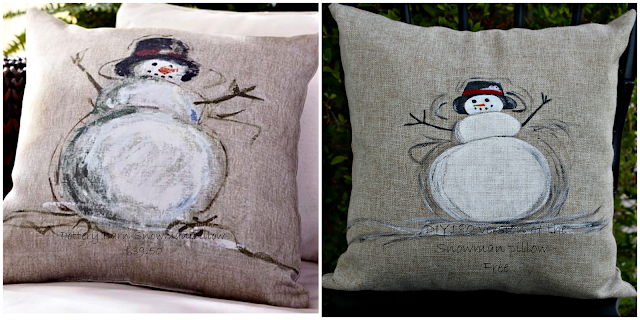 I love the snowman pillow! I'm not sure if I could do it as well, but I think I'll try! OMG, I love this! You are so talented! Wish I could free hand draw like this! I am seriously challenged in the drawing department. Your pillow is fabulous, just as nice as theirs! I am in the process of doing one of their snowflake pillows...we'll see what happens! This pillow is so awesome! I've never used the freezer paper method...you've inspired me! I would love to be able to draw but I am not talented like you are. Thanks for sharing I like it a lot. This is SUPER cute! I never would have been able to tell the difference. I LOVE this! You did such an amazing job, Vanessa! Great Knockoff Vanessa! I've never tried to transfer with freezer paper before and you may have just convinced me how easy it is! And gotta love free-ninety-free! Well done! I had no idea that you could transfer images with freezer paper. I'm sponsoring a new fashion club at my school and our first project is t-shirt design. I had planned to have them cut out a design on freezer paper, iron it on, and then paint it but I'm going to use your method instead. Not using exacto knives with 6th and 7th graders will be much safer! I definitely like your version of the pillow better. It is super cute! This is so adorable, I love snowmen so much. You did a fantastic job! And I too had no idea you could transfer using freezer paper that is amazing!! You knocked this one out of the park, Vanessa! LOVE it! This is so adorable. You are such a talented and smart lady! Thanks for sharing the how to and the inspiration! You did such an amazing job on this! I wish I had half of your artistic talent! You seriously ROCKED this one! I love yours better than the original! I'm a terrible pillow maker, but this is so darn cute I may have to try it. Thanks for sharing the transfer method too. I wouldn't have thought of using freezer paper to get the perfect picture on the pillow! Sharing & pinning my friend!! This is absolutely fabulous! I have never tried using freezer paper. Thanks for the easy tutorial! Hope to make one!!! That is awesome Vanessa!!! I agree..you rocked it!!! I love yours way better!! And oh my gosh, the freezer paper idea is fabulous. I've printed and transferred but never drawn and ironed to transfer. Brilliant! 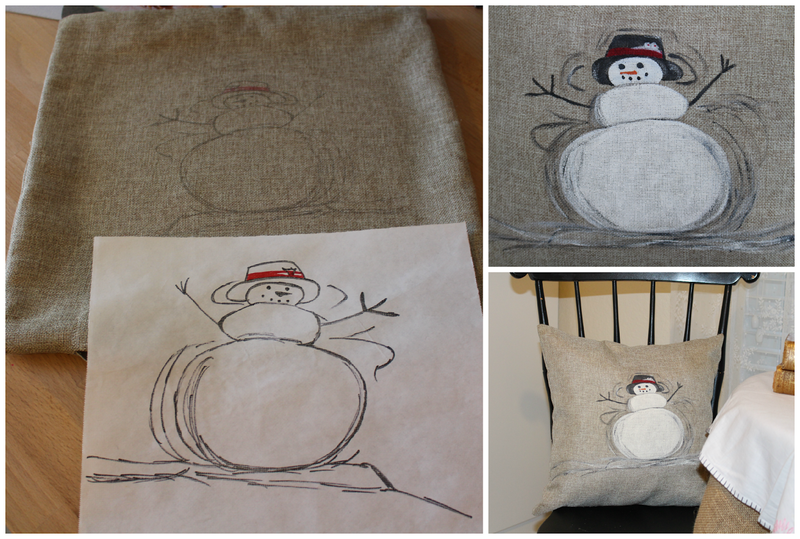 Your snowman pillow looks wonderful! So adorable! Yours is soooo much cuter! It truly looks like a print... you're very gifted with that paint brush of yours! This is so cute! I love snowmen and yours is snowy perfection. Your pillow was so much more appealing to my eyes that I believed you had your photos reversed..... went so far as to check the PB web site on that hunch. So now I know you are just that good! What a great addition to a chair or Sofa for the holidays, I've got to give this a try! Wish me luck! Happy holidays to you and thank you for sharing this great pillow project. I have a question though: why is it so difficult for me to make changes in what I've typed on this post? Have to go to 'preview', tap edit, go back to original, make the correction - as if that wasn't enough trouble.....if you don't hit the correct spot with the curser when you go back you have to repeat the entire process, must go back for every little spelling or syntax error.....Only one correction allowed per each edit, I almost wiped it and said forget this... Yours is not the first post where I've run into this problem, I usually stop, erase and go on with my life bc it's just too difficult. Your pillow is the exception, wanted to let you know how much I liked it And how talented I think you are!! Even though I had to go back 37, now 38 times, it's worth it! Thank you for stopping by. Not sure why you had so much trouble, unless you where on your cell phone. I know I have issues when I am on my cell, but I appreciate you leaving your message. Thank you and hope yours turns out great. Thank you again and have a beauitful holiday. Lovely, I am going to try this. I'm new to all this, what kind of paint did you use? Can you wash the pillow if need be? Thank you! Yes, please what kind of paint did you use...and did you use a sharpee just to do the outline or did you use the sharpee to outline after you painted the snowman. He or she is just delightful...great job!